The Independence Hotel is to celebrate the 70th anniversary of its founding in the Canaanite city of Nablus. It is still preserving its historical beauty and presence despite the boom in modern hotels in the city and across the occupied West Bank. 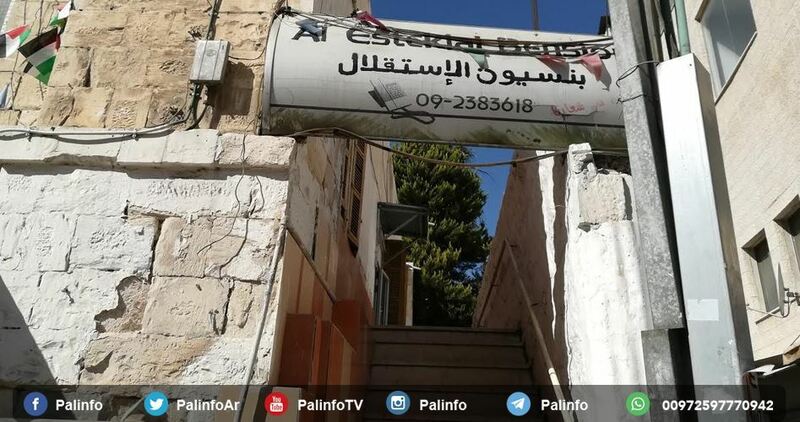 At the entrance to Hittin Street, which links the neighborhoods of Nablus with its old town, the Independence Hotel, run by Mustafa Eran and his brothers, attracts foreign and local tourists, though modestly recently. According to Mustafa Eran, 64, the hotel was founded in 1948 when the Nakba (catastrophe) of the Palestinian people took place. His father came to the city from Jaffa, where he worked in the tourist industry, with his work spreading to Haifa. He founded several small hotels, all of which were later closed except for the Independence Hotel, which became a historical landmark in the city. Anyone visiting the hotel would first walk through a narrow corridor and find on one side of which windows of one of the hotel rooms that date decades back. He would then encounter a large lounge with a large reception hall in the middle of which is a modest office, from which Eran manages the hotel. The rooms are spread on both sides of the building, some of which overlook Hittin Street, and the others overlook the Asi Cinema and the Nablus Municipality building, which has a garden full of trees and a water fountain. The hotel consists of six large and spacious rooms, according to Eran and a large 65-meter salon. Six families live on working in it, although the current economic situation barely covers the actual cost, the family’s insistence on preserving it as a legacy continues. Eran recalls the harsh conditions which the hotel experienced following the occupation of Nablus in 1967. The hotels of the city were banned from receiving guests for ten years. Israeli soldiers then occupied the hotel for 18 days and reoccupied it during the first intifada and the invasion of Nablus in 2002 for 13 days. This caused considerable damage to the hotel’s furniture and property. The hotel’s foreign customers come to know about the history of old Nablus. Tourists from France, Italy and Japan, stay at the hotel. Some tourist guides include information about the hotel. It is also close to the old town and the new neighborhoods, which attracts locals as well, especially merchants from Hebron and Jenin. Eran boasts that the hotel’s atmosphere makes it full of life than modern hotels, as its large salon hosted memorable discussions between traders and guests, which made it a special place for everyone who stayed there. This part of ‘The Crusades: An Arab Perspective’ explores the birth of the Muslim revival in the face of the Crusades. The Crusades: An Arab Perspective is a four-part documentary series telling the dramatic story of the crusades seen through Arab eyes, from the seizing of Jerusalem under Pope Urban II in 1099, to its recapture by Salah ad-Din (also known as Saladin), Richard the Lionheart’s efforts to regain the city, and the end of the holy wars in 1291. Part one looked at the First Crusade and the conquest of Jerusalem. In part two, we explore the birth of the Muslim revival in the face of the crusades. By the early 12th century, the crusades had successfully captured not only the holy city of Jerusalem but huge swaths of the Muslim Levant. 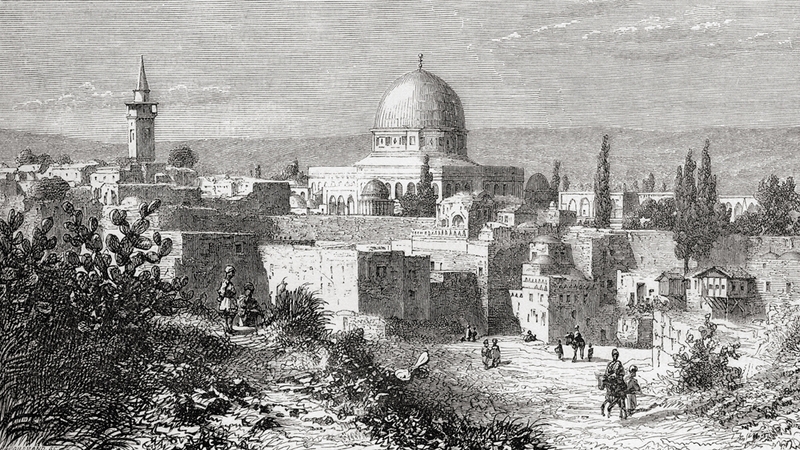 Islam’s third holiest site, the al-Aqsa Mosque, was in the hands of the crusaders. Their entrance to the city [of Jerusalem] was horrifying. They started with an infamous massacre. They killed people in the streets, in their houses and in alleyways. Arab sources talk about a hundred thousand people slaughtered. The Muslim world, a mighty power for the previous four centuries, was shocked by the Christian annexation of large parts of their empire. With Jerusalem under their control, the crusaders began to build a new system of rule in the lands they had captured. They expelled many of its original inhabitants, including Muslims, Jews, and eastern Christians, and began to fill Jerusalem with settlers arriving from Western Europe. “Those people were slaves and vassals and had no rights at all in Europe. When they came to us, their whole life changed when they became landowners. Their social status changed and so did the demographic and social class structure,” explains Afaf Sabra, professor of history, Al-Azhar University. Furthermore, the commanders of the First Crusade, lesser knights from Europe, began to style themselves monarchs in the lands they conquered. 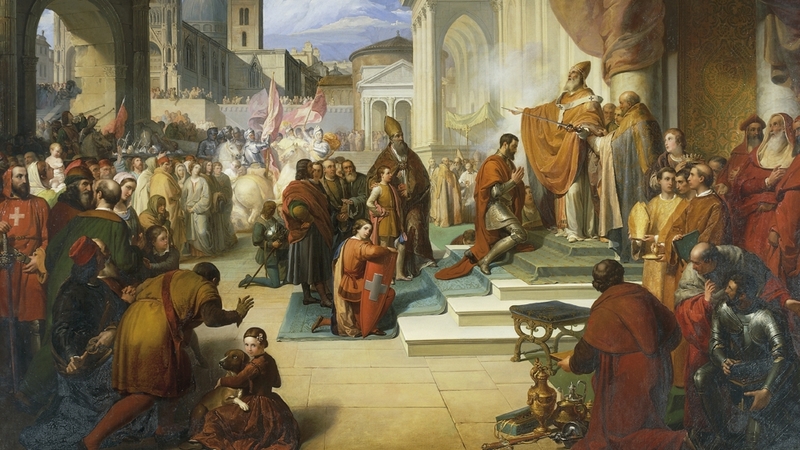 In July 1100, Baldwin of Boulogne, one of the leaders of the First Crusade, was crowned Baldwin I, King of Jerusalem. “With the establishment of the Kingdom of Jerusalem, the county of Edessa and the Principality of Antioch, expansion into the Arab lands became easier. The new colonial leaders began expanding their realm very easily,” says Qassem Abdu Qassem, head of the history department, Zaqaziq University. Within a decade, most of the Levantine coast was in the crusaders’ hands. And the Christian enclaves in the east now numbered four, with the addition of a new county in Tripoli. “The coastal area was for the crusaders a very, very tactically significant area, both to supply provisions and to bring pilgrims through the harbours. So securing the coastal areas was a crucial part of crusaders’ tactics,” notes Jan Vandeburie, of the School of History, at the University of Kent. The economics of the war soon began to dominate the crusades and the Regent of Antioch, Tancred, marched his army towards Aleppo, then the trade capital of the Levant. Aleppo’s ruler, Radwan, who has been described as spineless and servile, had a friendly relationship with the crusaders. The story goes that he even put a cross on the mosque of Aleppo, which provoked a strong reaction from the locals as they revolted against their duplicitous ruler. The uprising was irresistible and the Muslim people forced the caliphate in Baghdad, weak though it was, to take action. Abbasid Caliph Al-Mustazhir asked for help from his protector, the Seljuk Sultan. The governor of Mosul, Mawdoud, was ordered to gather his army and put an end to the crusader siege of Aleppo. Mawdoud was successful in forcing the crusaders to lift the siege of Aleppo because other crusader entities would not come to support them. But Aleppo’s ruler Radwan prevented Mawdoud’s army from entering the city. “At the same time, Toghtekin [the governor of Damascus] was being attacked by the Kingdom of Jerusalem. Mawdoud’s forces came to help him resist the attack. Mawdoud met King Baldwin in a battle near Tiberias known as the battle of As-Sannabra during which the Muslims defeated the crusaders,” says Sabra. Toghtekin welcomed Mawdoud gratefully after his victory at As-Sannabra, but later had him assassinated. The new governor of Mosul, Imad Ed-Din Zengi, seized control of Aleppo in 1128. Bringing Mosul and Aleppo together “meant taking control of a major gateway to the internal regions of the Levant and towards Mesopotamia,” says Ahmad Hetait, former dean at the Faculty of Arts at Islamic University. The Muslims’ initial response had been inadequate but now it was time for a revival. The revival arose from the people, not the rulers. In effect, cutting off trade and communication routes between Antioch and Edessa, along with that of the county of Tripoli and the Kingdom of Jerusalem, posed a major obstacle to the crusaders as they confronted the Islamic world. “The crusaders had relied on dividing the Muslim fiefdoms to deal with them separately, thanks to their insular rulers. Now a unified front was born,” says Muhammad Moenes Awad, professor of history at Sharjah University. With Damascus protected by a truce with the Kingdom of Jerusalem, Imad Ed-Din Zengi began to prepare for what would be his greatest military achievement: On December 25, 1144, his army attacked and captured the County of Edessa in a matter of hours. It had been the first crusader state in the region but was now the first city to be retrieved by Muslims. “This is seen as a breakthrough, the real start, the revival of the ‘jihad’ in the Muslim Near East. It’s the first big defeat for the crusaders and it shows that they can actually be defeated and that the Muslim revival can begin to gather some pace,” says Jonathan Phillips, professor of history at Royal Holloway, University of London. Imad Ed-Din Zengi’s victory in Edessa was a turning point; it lifted the Muslims’ morale and enthusiasm for the fight. Two years later, however, Imad Ed-Din Zengi was killed by his own slave. He was succeeded by his son, Nour Ed-Din. The loss of Edessa was not taken lightly in Europe. In 1147, Pope Eugene held a religious council calling for the Second Crusade, to be led by two European kings, Louis VII of France and Conrad III of Germany. In the summer of 1147, the armies set off towards the Holy Land and after almost a year, the German and French forces finally arrived in Jerusalem. Soon after, they decided to launch an attack on Damascus, which ended in disaster. “They retreated, there wasn’t a great battle. They weren’t defeated in some epic struggle, they just slunk away. And that’s a real blow to the morale of the crusaders in the west,” says Phillips. The tragic failure of the Second Crusade was by no means the last disaster to befall the Christians. Six years later, Nour Ed-Din finally managed to annex Damascus, the very city they had failed to capture. Qassem Abu Qassem describes Nour Ed-Din Zengi as a leader who “had devoted his whole life to the principle of jihad”, and says that by uniting Muslims under one banner, he enabled them to recover occupied land and Jerusalem. “It was here that an Islamic revival was born. It had begun before but at this time it became more organised, less random,” concludes Afaf Sabra. Special to The Great War Project. (1-4 May) The British may have been defeated at Kut in Mesopotamia on the last day of April a century ago, but they are not defeated in the Middle East. At least that’s the way they see it. Just three days before the British surrender in Kut — after a Turkish siege of 145 days — British and French diplomats, negotiating for months in Paris, sign a secret pact partitioning the Middle East after the war. The document, known as the Sykes-Picot agreement, is the work of Sir Mark Sykes from Britain and Georges Picot of France. They hold private talks for months, negotiating the postwar partition of the Middle East. Britain would be sovereign over the port city of Haifa [now in northern Israel] and the crusader city of Acre [also in northern Israel], thus controlling the bay that would serve as the Mediterranean terminus for oil pipelines coming from Mesopotamia. And finally, Gilbert observes, an Arab state under British protection would stretch from the Mediterranean to the Red Sea. …on the Tigris River a hundred miles south of Baghdad. “More than 9,000 troops surrendered to the Turks on April 29th,” a century ago, according to Gilbert. Nonetheless, in Britain the surrender at Kut comes as a great shock. “More men had surrendered to the despised Turk at Kut,” Gilbert writes, “than had surrendered to the Americans at Yorktown,” (a great victory for the Americans during their revolutionary war). What’s more, this comes just four months after the Turks drive the British and allied troops off the Gallipoli peninsula. The British position in western Turkey and the Middle East is disastrous. A veritable death march is beginning. There is nothing the observing British officers can do. And what of the work of Sykes and Picot? Two years ago today, on July 7, 2014, the Israeli government launched a horrific 51-day air, land and sea attack on the people of Gaza. Israeli Defense Forces (IDF) fired missiles, rockets, artillery and tank shells relentlessly on 1.8 million Palestinians squashed by Israeli land and sea blockades into a narrow strip 25 miles long and five miles wide, one of the most densely populated places in the world. Nearly 500 Palestinians were killed by Israeli assassin drones. Drone warfare has become the norm for both the United States and Israel. Drones fly above Gaza 24 hours a day watching the movements of every Palestinian and ready to fire rockets at those chosen to die by the IDF. Al Mezan Center for Human Rights documents that, from 2008 until October 2013, out of 2,269 Palestinians killed by Israel, 911 were killed by drones, most during the 2008-2009 Operation Cast Lead. In the 2012 Operation Pillar of Defense, 143 out of 171 Palestinians killed by Israel were by drone attack. In the 2014 Israeli attack on Gaza, the Al Mezan Center for Human Rights documents 497 Palestinians killed by drones, 32 percent of Palestinian deaths. At the end of the 51 days, 2,310 Palestinians had been killed, 10,600 wounded, including 3,300 children; 872 homes were totally destroyed or severely damaged, and the homes of 5,005 families were damaged but still inhabitable; 138 schools were damaged or destroyed, 26 hospitals and health facilities were damaged. According to the United Nations Office for the Coordination of Humanitarian Affairs (OCHA), over 273,000 Palestinians in the Gaza Strip had been displaced of whom 236,375 (over 11 percent of the Gazan population) were taking shelter in 88 United Nations schools. Palestinian militias shot homemade rockets killing 66 Israeli soldiers, five Israeli civilians, including one child, and one Thai citizen in Israel. Now two years after the Israeli attack on Gaza, tensions in the West Bank are exploding. Beginning in October 2015, a few West Bank Palestinian youth have forsaken non-violent confrontation with Israeli military and have taken up knives instead of rocks in the latest intifada against Israeli occupation and oppression, against the continued building of illegal settlements on Palestinian lands and against the imprisonment of hundreds of Palestinian youth. The use of knives against IDF soldiers has expanded to deaths of Israeli civilians as well, including a 13-year-old girl in her home. Thirty-four Israelis, two U.S. citizens, an Eritrean and a Sudanese have been killed in the knife, gun or car-ramming attacks, and 214 Palestinians have been killed by IDF soldiers during this period. The potential for Israeli response/revenge to these knife attacks is great and would probably not be directed to just the West Bank, but also toward Gaza. As with other conflicts, the stories of death and of survival of civilians trapped in merciless bombings and fighting should compel leaders to work to end conflicts, but seldom do. A new book published two days ago on July 5, 2016 chronicles the 2014 IDF attack on Gaza and focuses on the psychological and physical destruction suffered by the people of Gaza by one particular weapon system — the assassin drone that killed 497 during the 2014 attack. Palestinian writer Atef Abu Saif provides the day-by-day life of a family and a community under fire from an enemy in the sky -beginning with July 7, 2014- two years ago today. The idea of a museum to research and document animals in Palestine came from the first Palestinian zoologist, Dr. Sana Atallah. Born in 1943, Atallah grew up in Beit Sahour, Palestine and earned his bachelor’s and master’s degrees in science at the American University of Beirut. His master’s thesis research was on rodents. He then completed his PhD in 1969 at the University of Connecticut, U.S.A., on mammals of the Eastern Mediterranean region. Offered a position at the Pahlavi University in Tehran (later called Shiraz University) in 1970, Atallah taught only one semester before being killed, at the age of 27, in a tragic car accident along with a student researcher. Despite his young age, Atallah had already produced over a dozen scientific publications, and his doctoral thesis was published posthumously in two parts (1977 and 1978). In the 1960s Atallah collected specimens from Jordan, Lebanon, Syria, and Palestine. His research collection is now spread among many museums, including those at AUB, University of Connecticut, Shiraz University, and here in Palestine. In 1972, David Harrison named a subspecies of the hare Lepus capensis atallahi in honor of his departed friend Atallah—who had earlier named a taxon in honor of Harrison (Acomys russatus harrisoni) and one in honor of his AUB advisor and friend (Acomys lewisi). As a child, Professor Mazin Qumsiyeh, founder of the Palestine Museum of Natural History, often accompanied his uncle Sana Atallah for research in the field, which inspired his love of nature in Palestine. Qumsiyeh was thirteen years old when Atallah died in a car accident, and that is when he resolved not only to fulfill his uncle’s mission of doing research on mammals in the Arab world, but also to build a museum. Qumsiyeh finished high school in Bethlehem, among the top ten students in the Tawjihi matriculation exam for Palestinians (West Bank and Gaza). He earned his bachelor’s degree at Jordan University and while still an undergraduate, published his first research paper (on new records of bats from Jordan). He went on to get his Master’s of Science degree at the University of Connecticut (on the bats of Egypt) and his PhD at Texas Tech University (on chromosomes of gerbils and jirds). He then did medical genetics training in Memphis, Tennessee, and served on the faculties of medicine at three U.S. universities (Tennessee, Duke, and Yale), before returning to Palestine in 2008. Prof. Qumsiyeh has published over 130 scientific papers on topics ranging from systematics to biodiversity to cancer, plus hundreds of other refereed articles. His books include Bats of Egypt, Mammals of the Holy Land, Sharing the Land of Canaan: Human Rights and the Israeli/Palestinian Struggle (in English, Spanish, and German) and Popular Resistance in Palestine: A History of Hope and Empowerment (Arabic, English, French, forthcoming in Italian). Since returning to Palestine 2008, Prof. Qumsiyeh has developed a system for working with and empowering young people, as he believes this is the key to freedom and development in Palestine. He and his students were the first Palestinians to publish research on biodiversity in such groups as scorpions and amphibians, to demonstrate genetic impact on human health of Israeli industrial settlements, to study infertility among Palestinian males, to study cancer cytogenetic in Palestine, and on other topics. Based on these studies and others, plus the work and ideas of dozens of young volunteers, the Palestine Museum of Natural History was launched in June 2014 with ambitious plans—described in our section on mission and goals. It has not been an easy task to do this. The Museum was started with land and building facility use from Bethlehem University and seed operating money from Dr. and Mrs. Qumsiyeh and from individuals. In the transition period of 2014-2017, we rely heavily on volunteers and we welcome your support (see sections on staff and support). We are working to apply for institutional fundings in order to bring on board much needed professional team members. Like the Ikhwan before, ISIS represents a rebellion against the official Wahhabism of modern Saudi Arabia. And yet ironically its roots are firmly anchored in Wahhabism. ISIS’ swords, covered faces and cut-throat executions all recall the original Brotherhood. But it is unlikely that the ISIS hordes consist entirely of diehard jihadists. A substantial number are probably secularists who resent the status quo in Iraq – Baathists from Saddam Hussein’s regime and former soldiers of his disbanded army. A significant proportion of those convicted of terrorism offences since the 9/11 attacks have been non-observant, or are self-taught. Misguided or disguised ISIS militants are certainly not looking for religious enlightenment; rather they have been sold to a violence which speaks to their own pain and sense of loss. Two wannabe jihadists who set out from Birmingham for Syria in May 2014 had ordered Islam for Dummies from Amazon. ISIS militants are no Muslim devouts, only sociopathic begots. It would be a mistake to see ISIS as a throwback; it is a thoroughly modern movement which has drawn its inspiration from the Ikhwan crusades. It has become an efficient, self-financing business with assets estimated at $2bn. Its looting, theft of gold bullion from banks, kidnapping, siphoning of oil in the conquered territories and extortion have made it the wealthiest jihadist group in the world. There is nothing random or irrational about ISIS violence. The execution videos are carefully and strategically planned to inspire terror, deter dissent and sow chaos in the greater population. ISIS is not just a terror army, it is a terror movement with imperialistic ambitions. And if its methods are terrifying and bloody, they are hardly an innovation. There too ISIS drew from past examples – Mass killing is after all a thoroughly modern phenomenon, one which western powers gave into many times over. During the French Revolution, which led to the emergence of the first secular state in Europe, the Jacobins publicly beheaded about 17,000 men, women and children. In the 1990s, Armenia slaughtered hundreds upon hundreds of Azeris in a grand scale flash ethnic cleansing campaign. Similarly, ISIS uses violence to achieve a single, limited and clearly defined objective that would be impossible without such slaughter. As such, it is another expression of the dark side of modernity – industrial killing to achieve politico-strategic goals. Above all, ISIS wants rebuild the caliphate Mustafa Kemal Atatürk in Turkey declared null and void in 1925. The caliphate had long been a dead letter politically, but because it symbolised the unity of the ummah and its link with the Prophet, Sunni Muslims mourned its loss as a spiritual and cultural trauma. Yet ISIS’s projected caliphate has no support among ulema internationally and is derided throughout the Muslim world. That said, the limitations of the nation state are becoming increasingly apparent in our world; this is especially true in the Middle East, which has no tradition of nationalism, and where the frontiers drawn by invaders were so arbitrary that it was well nigh impossible to create a truly national spirit. Here, too, ISIS is not simply harking back to a bygone age but is, however eccentrically, enunciating a modern concern. The liberal-democratic nation state developed in Europe in part to serve the Industrial Revolution, which made the ideals of the Enlightenment no longer noble aspirations but practical necessities. It is not ideal: its Achilles heel has always been an inability to tolerate ethnic minorities – a failing responsible for some of the worst atrocities of the 20th century. In other parts of the world where modernisation has developed differently, other polities may be more appropriate. So the liberal state is not an inevitable consequence of modernity; the attempt to produce democracy in Iraq using the colo­nial methods of invasion, subjugation and occupation could only result in an unnatural birth – and so ISIS emerged from the resulting mayhem. ISIS has declared war against all — Sunnis, Shiites, Christians, Jews, Buddhists, Yazidis — there is no escaping this reactionary band of Godless criminals and murderers. Interestingly, Saudi Arabia has now become the designated target of ISIS militants. As if playing out a Greek tragedy, ISIS seeks now to strike at its creator, intent on pushing the boundary of the acceptable to reinvent itself not a religion but a radical atheist movement which stands in negation of the Holy, in all its forms and all its manifestations. It was ibn Abdul Wahhab who declared it incumbent upon his followers to wage “Jihad” against all the Muslims, and that it was permitted for them to enslave their women and children. ISIS clearly heard its father’s calling. This approach was derived from the influence of Ibn Taymiyyah, who remains to this day an important influence guiding the principles of Islamic terrorism. It is strange that, of all the Muslim scholars throughout history that he could have chosen from, that Wahhab, and all modern Muslim “reformers” after him, emphasize the importance of Ibn Taymiyyah, whose orthodoxy was questionable, and who in his own time was repeatedly in conflict with the leading scholars and the ruling establishment. Our century so far has been overshadowed by a plague which roots, western powers have proclaimed, can be found in Islam and its practice. And though politicians have been careful not to publicly brand all Muslims terrorists, the narrative has nevertheless been one of suspicion and assumption. The words terror and Islam have been juxtaposed too many times in the media for anyone to believe that it was not by “design.” There has been a war of words against both Islam and Muslims. Its aim is rather simple and only too predictable since it falls within an equation of greed and cynicism. By ridiculing Islam and dehumanizing its followers, western powers have essentially laid the ground for intervention – positioning their armies within a narrative of moral salvation and liberation when their aims are everything but. Iraq serves a perfect example. Even though US soldiers committed heinous crimes against Iraqis, despite the rapes, the raids and the mass massacres; in the face of systematic tortures and aggravated human rights violations, Washington still claimed moral high ground, arguing the greater good required decisive actions. Truth is, from the moment the towers of the Trade Center tumbled down to the ground in great swirls of smoke and ashes, the MENA and with it all Muslims within it, have been lined up as sacrificial lambs to the altar of imperialism. If anyone and anything has benefited from this grand war on terror, it is surely weapons dealers and all those behind who feeds corporate America its fill of blood. The signs are everywhere for those who care to see! And if speaking the truth is conspiratorial theorism then so be it! Terror was engineered and unleashed as a weapon of mass destruction and a political trojan horse. What better way to control the narrative and outcome of wars but by creating the very crisis, one intends to find solutions to, while keeping a hand in both pots? If not for 9/11 Afghanistan and subsequently Iraq would not have been invaded. Arguably, without the war on terror Americans would still enjoy some of their civil liberties, and terminologies such as rendition and institutionalized torture might not have become generic terms. But then again corporations would not have seen their bottom lines explode under the influx of billions of dollars in weapon sales, security deals, and oil concessions the way it did. The terms “follow the money” takes on a completely different meaning when correlated to terror. But if corporate America has indeed played the terror card to forward its own very selfish and radical form of capitalism, it did not invent the ideology of terror per se – it only rebranded and repackaged it to fit its purpose. It is crucial to understand though that ISIS, terror’s modern manifestation and expression, carries no tie with Islam. NONE! Actually both Prophet Muhammad and Imam Ali warned us against this black plague. In this extract, Imam Ali clearly refers to a time when Muslims will cross swords with other Muslims while in alliance with non-Muslims. And because western powers are undeniably colluding with those radicals they claim to want to destroy – training them and funding them in plain view, one can legitimately ponder. Looking at events currently unfolding in the Middle East such warnings have found a deep echo within the Muslim community and religious leaders, among whom most prominently Sayyed Hassan Nasrallah and Ayatollah Ali Khamenei. Both have mapped their decisions within such religious parameters. And whether one agrees with those men or not is not the point – understanding where they are coming from and where they stand however, is. And if we can agree that not all is as it seems, then could it not be that those enemies we have imagined are indeed – not? If ISIS has certainly been sold as an Islamic movement, everything it professes and teaches stands against Islam and its teachings. This divide actually goes beyond Islam’s great schism – which schism it needs to be noted remains part of this myth Saudi Arabia has been so eager on selling the world. If indeed religious disagreements have occurred over the centuries and if Muslims have in truth fought and argue over the legitimacy, legality and religious superiority of their schools of thoughts and judicial principles, scholars did so in the knowledge and express belief that while men are flawed, Islam is perfect. Islam’s disagreements came about out from a desire to walk better on God’s path, not to obliterate people with an implacable and merciless truth. Looking back at the long line of prophets, from Adam to Noah, Ibrahim, Jesus, Yehia and Muhammad, all shared in the Oneness which is God’s ultimate command, God’s boundless mercy onto His creation and His injunction of peace. And if those holy messengers came at different times and places in our history, the essence of their message has been as permanent and immovable as God’s will. From Adam’s first cries of remorse and calls for forgiveness, to Prophet Muhammad’s last breath, God’s message onto us has always been Islam – as Islam means submission. In truth, the only real freedom which was ever given to us is that to submit, body and soul to The Creator of All things. Islam did not start at Prophet Muhammad, rather it was reborn with him and through him; a last call before the sunset, a last mercy and guidance for us to follow – or not – a last ray of hope before evil can get its fill and the last chapter of our fate written down. Islam was on the first day as it will be on the last day – it is us which have called it many things in our need to possess and label the divine. It is us again which have strayed and plotted, coveted and perverted to serve very earthly ambitions. Wahhabism is no more than an engineered perversion, a division, an abomination which has but spread like a cancer onto the Islamic world and now threatens to destroy all religions. Wahhabism and its legions: Al Qaeda, ISIS, Boko Haram, are but the manifestations of a reactionary atheist movement which seeks the death of all faiths. Wahhabism is not of Islam and Islam will never be of Wahhabism – it is a folly to conceive that Islam would ever sanction murder, looting and atrocious barbarism. Islam opposes despotism, injustice, infamy , deceits, greed, extremism, asceticism – everything which is not balanced and good, fair and merciful, kind and compassionate. If anything, Wahhabism is the very negation of Islam. As many have called it before – Islam is not Wahhabism. Wahhabism is merely the misguided expression of one man’s political ambition – Muhammad ibn Abdul Wahhab, a man who was recruited by Empire Britain to erode at the fabric of Islam and crack the unity of its ummah (community). As Wahhabism began its land and mind grab in Hijaz – now known as Saudi Arabia – one family, Al Saud saw in this violent and reactionary school of thought a grand opportunity to claim and retain power. This unholy alliance has blotted the skies of Arabia for centuries, darkening the horizon with its miasms. Wahhabism has now given birth to a monstrous abomination – extreme radicalism; a beast which has sprung and fed from Salafis and Wahhabis poison, fueled by the billions of Al Saud’s petrodollars; a weapon exploited by neo-imperialists to justify military interventions in those wealthiest corners of the world. But though those powers which thought themselves cunning by weaving a network of fear around the world to better assert and enslave are losing control over their brain-child, ISIS and its sisters in hate and fury, as they all have gone nuclear, no longer bound by the chains their fathers shackled them with. ISIS’s obscene savagery epitomises the violence which is inherent and central to Wahhabism and Salafism – its other deviance. And though the world knows now the source of all terror, no power has yet dared speak against it, instead the world has chosen to hate its designated victim – Islam. In July 2013, the European Parliament identified Wahhabism as the main source of global terrorism, and yet the Grand Mufti of Saudi Arabia, condemning ISIS in the strongest terms, has insisted that “the ideas of extremism, radicalism and terrorism do not belong to Islam in any way”. But then again the Grand Mufti might remain oblivious to the history of Wahhabism or what Wahhabism actually professes. During the 18th century, revivalist movements sprang up in many parts of the Islamic world as the Muslim imperial powers began to lose control of peripheral territories. In the west at this time, governments were beginning to separate church from state, but this secular ideal was a radical innovation: as revolutionary as the commercial economy that Europe was concurrently devising. No other culture regarded religion as a purely private activity, separate from such worldly pursuits as politics, so for Muslims the political fragmentation of society was also a religious problem. Because the Quran had given Muslims a sacred mission – to build a just economy in which everybody is treated with equity and respect – the political well-being of the ummah was always a matter of sacred import. If the poor were oppressed, the vulnerable exploited or state institutions corrupt, Muslims were obliged to make every effort to put society back on track. If 18th-century reformers were convinced that should Muslims ever regain lost power and prestige, they would have to return to the fundamentals of their faith, ensuring that God – rather than materialism or worldly ambition – dominated the political order, Wahhabism would come to pervert such desires. There was nothing militant about this “fundamentalism”; not yet, rather, it was a grassroots attempt to reorient society and did not involve jihad. Only, if the idea of going back to the root of Islam at a time when society had strayed from the path was indeed laudable, Wahhabism would work to betray such ideal by twisting on its head Islam’s most sacred pillars, perverting Islamic law and the interpretation of its Scriptures to serve the mighty and enslave the weak. Under Wahhabism’s interpretation of Islam, women reverted to being objectified. Those many great women Islam saw rise under the strict protection of the Quran, those models Muslim womencame to look up to and aspire to become – Maryam, Khadijah, Fatimah, Zaynab; Muhammad ibn Abdel Wahhab would have had locked up in chains in their home. When Islam gave women their rightful place within society, Wahhabism denied them everything. And for those of you who continue to live under the premise that Islam is profoundly unfair against women, do remember it is not Islam but rather men’s interpretations of it which is the source of your ire. Islam secured women’ status according to God’s will. Islam poses both men and women on equal footing in terms of their faith – it is only in their duties and responsibilities which they differ, not worthiness. Islam calls on men to provide for women and offer them security, both financial and physical. Under Islam women are free to marry, divorce and work. Under Islam women cannot be bought, bartered or oppressed. Under Islam women enjoy more freedom than most western women have been given. It is society and cultural deviations which have denied them those rights, not Islam. Women rights are forever imprinted in the Quran – this reality will never change, no matter how men chose to interpret it and falsify it. Like Martin Luther, ibn Wahhab claimed he wanted to return to the earliest teachings of Islam and eject all later medieval accretions. To achieve such ambitions he opposed Sufism and Shia Islam, labelling them as heretical innovations (bidah) as both opposed tyranny in faith. He went on to urge all Muslims to reject the learned exegesis developed over the centuries by the ulema (scholars) and interpret the texts for themselves, or rather under his guidance. This naturally incensed the clergy and threatened local rulers, who believed that interfering with these popular devotions would cause social unrest. Eventually, however, ibn Wahhab found a patron in Mohammed Ibn Saud, a chieftain of Najd who adopted his ideas. Ibn Saud quickly used Wahhabism to support his military campaigns for plunder and territory, insisting such violence was all in the name of the greater good. To this day Al Saud’s house is following in such bloody footsteps. Although the scriptures were so central to ibn Wahhab’s ideology, by insisting that his version of Islam alone had validity, he distorted the Quranic message in the most violent way. The Quran firmly states that “There must be no coercion in matters of faith” – Quran 2:256. It rules that Muslims must believe in the revelations of all the great prophets (3:84) and that religious pluralism was God’s will (5:48). Until Wahhabism came knocking, Muslims remained traditionally wary of takfir, the practice of declaring a fellow Muslim to be an unbeliever (kafir). Hitherto Sufism, which had developed an outstanding appreciation of other faith traditions, had been the most popular form of Islam and had played an important role in both social and religious life. “Do not praise your own faith so exclusively that you disbelieve all the rest,” urged the great mystic Ibn al-Arabi (d.1240). “God the omniscient and omnipresent cannot be confined to any one creed.” It was common for a Sufi to claim that he was a neither a Jew nor a Christian, nor even a Muslim, because once you glimpsed the divine, you left these man-made distinctions behind. After ibn Wahhab’s death, Wahhabism became more violent, an instrument of state terror. As Al Saud sought to establish an independent kingdom, Abd al-Aziz Ibn Muhammad, Ibn Saud’s son and successor, used takfir to justify the wholesale slaughter of resistant populations. In 1801, his army sacked the holy Shia city of Karbala in what is now Iraq, plundered the tomb of Imam Hussain, and slaughtered thousands of Shias, including women and children. A few years later, in 1803, in fear and panic, the holy city of Mecca surrendered to the Saudi leader, wary of that his army would do to the population. Little do we remember the sacking of the holy city of Medina, when Al Saud’s legions ransacked mosques, schools and homes. Al Saud’s army murdered hundreds of men, women and children, deaf to their screams. As imams pleaded for the most sacred relics of Islam to be protected, Al Saud’s men pillaged and looted, setting fire to Medina’s library. Al Saud made an example out of Medina, the very city which proved so welcoming to Islam. On the ground which saw rise the first mosque of Islam, Al Saud soaked the earth red with blood. Where the footsteps of the last Prophet of God still echo, Al Saud filled the air with ghastly cries of horrors. But such terror has been erased from history books. Such tales of blood and savage betrayals have been swallowed whole by Al Saud as this house attempted to re-write history and claim lineage to the house of the prophet. Eventually, in 1815, the Ottomans despatched Muhammad Ali Pasha, governor of Egypt, to crush the Wahhabi forces and destroy their capital. But Wahhabism became a political force once again during the First World War when the Saudi chieftain – another Abd al-Aziz – made a new push for statehood and began to carve out a large kingdom for himself in the Middle East with his devout Bedouin army, known as the Ikhwan, the “Brotherhood”. In the Ikhwan we see the roots of ISIS. To break up the tribes and wean them from the nomadic life which was deemed incompatible with Islam, the Wahhabi clergy had settled the Bedouin in oases, where they learned farming and the crafts of sedentary life and were indoctrinated in Wahhabi Islam. Once they exchanged the time-honoured ghazu raid, which typically resulted in the plunder of livestock, for the Wahhabi-style jihad, these Bedouin fighters became more violent and extreme, covering their faces when they encountered Europeans and non-Saudi Arabs and fighting with lances and swords because they disdained weaponry not used by the Prophet. In the old ghazu raids, the Bedouin had always kept casualties to a minimum and did not attack non-combatants. Now the Ikhwan routinely massacred “apostate” unarmed villagers in their thousands, thought nothing of slaughtering women and children, and routinely slit the throats of all male captives. In 1915, Abd Al-Aziz planned to conquer Hijaz (an area in the west of present-day Saudi Arabia that includes the cities of Mecca and Medina), the Persian Gulf to the east of Najd, and the land that is now Syria and Jordan in the north, but during the 1920s he tempered his ambitions in order to acquire diplomatic standing as a nation state with Britain and the United States. The Ikhwan, however, continued to raid the British protectorates of Iraq, Transjordan and Kuwait, insisting that no limits could be placed on jihad. Regarding all modernisation as bidah, the Ikhwan also attacked Abd al-Aziz for permitting telephones, cars, the telegraph, music and smoking – indeed, anything unknown in Muhammad’s time – until finally Abd Al-Aziz quashed their rebellion in 1930. After the defeat of the Ikhwan, the official Wahhabism of the Saudi kingdom abandoned militant jihad and became a religiously conservative movement. But the Ikhwan spirit and its dream of territorial expansion did not die, instead it gained new ground in the 1970s, when the Kingdom became central to western foreign policy in the region. Washington welcomed the Saudis’ opposition to Nasserism (the pan-Arab socialist ideology of Egypt’s second president, Gamal Abdel Nasser) and to Soviet influence. After the Iranian Revolution, in 1979 it gave tacit support to the Saudis’ project of countering Shia Islam by Wahhabizing the entire Muslim world. Just as Nasserism posed a threat to both the Saudis and the US in that it entailed independence and a supranational sense of belonging and solidarity, in opposition to colonialism and feudalism, Iran Shia democratic movement presented too much of a pull for countries in the region to follow to be allowed to shine forth. And so the wheels of propaganda were set in motion and Iran became western powers and its allies’ designated enemy. Right alongside Soviet Russia, Iran became the source of all evil, while all the while Saudi Arabia was left to industrialize radicalism on a mass scale. The soaring oil price created by the 1973 embargo – when Arab petroleum producers cut off supplies to the U.S. to protest against the Americans’ military support for Israel – gave the Kingdom all the petrodollars it needed to export its idiosyncratic form of Islam. The old military jihad to spread the faith was now replaced by a cultural offensive. The Saudi-based Muslim World League opened offices in every region inhabited by Muslims, and the Saudi ministry of religion printed and distributed Wahhabi translations of the Quran, Wahhabi doctrinal texts and the writings of modern thinkers whom the Saudis found congenial, such as Sayyids Abul-A’la Maududi and Qutb, to Muslim communities throughout the Middle East, Africa, Indonesia, the United States and Europe. In all these places, they funded the building of Saudi-style mosques with Wahhabi preachers and established madrasas that provided free education for the poor, with, of course, a Wahhabi curriculum. Slowly Muslims’ understanding of Islam became polluted by Wahhabism and Sunni Muslims began to think and breath Wahhabism, no longer in tune with its own religious tradition, cut off from free-thinking Islam, moderate Islam, compassionate Islam and non-violent Islam. At the same time, young men from the poorer Muslim countries, such as Egypt and Pakistan, who had felt compelled to find work in the Gulf to support their families, associated their relative affluence with Wahhabism and brought this faith back home with them, living in new neighbourhoods with Saudi mosques and shopping malls that segregated the sexes. The Saudis demanded religious conformity in return for their munificence, so Wahhabi rejection of all other forms of Islam as well as other faiths would reach as deeply into Bradford, England, and Buffalo, New York, as into Pakistan, Jordan or Syria: everywhere gravely undermining Islam’s traditional pluralism. Hebron / Al-Khalil is the second largest city in the West Bank and the largest in the southern West Bank, located 32 kilometers south of Jerusalem. The city of Hebron has an estimated total population of 200,000 inhabitants. Approximately 40,000 Palestinians live in the Old City. Around 400-850 Israeli settlers reside in the core of the city; an additional 8,000 settlers reside in the Kiryat Arba settlement, on the outskirts of Hebron. Hebron is a sacred site for all three Abrahamic faiths (Islam, Christianity and Judaism) due to the belief that the biblical prophet Abraham and his wife Sarah are buried together with Isaac, Rebecca, Jacob and Leah in the place where the Ibrahimi Mosque (Tomb of the patriarchs) is built. The Old City of Hebron grew around this important monument. Due to its religious significance, Hebron became a stronghold for the religious extremists within the settler movement, including Gush Emunim (‘Bloc of the Faithful’) and semi-underground organisations such as Kach and Kahane Chai (‘Kahane Lives’), which played a major role in initiating and developing the settlements in Hebron. After the massacre in the Ibrahimi Mosque, they were designated terrorist organisations . Hebron is the only Palestinian city with Israeli settlements in the middle of it. They are built in and around the Old City, which traditionally served as the commercial center for the entire southern West Bank. Hebron’s fundamentalist settlers, influenced by the thought of Rabbi Avraham Yitzhak Kook, are characterised by their extreme ideologies and literal interpretation of religious texts. They are united in their belief that the Land of Israel is “the spatial center of holiness in the world” and that Hebron and the rest of the West Bank is considered Jewish by divine right. For this reason they agreed that the sanctity of the land must prevent the receding of the territory conquered during the 1967 war. They fully believe in the importance of their role to colonize and live in the occupied land. They are united in their objective of restoring the Jewish life and expanding the Jewish community in Hebron. Nowadays the most radical settlers live in Hebron’s Old City illegally, contributing to the transformation of the Old city into ghost town. The Israeli settlements in Hebron were originally initiated by individuals, and not by the government of Israel. Yet, the development and expansion of them were carried out over the years with the approval, support, cooperation, and even encouragement of various Israeli governments. Israel provides a wide range of financial benefits, essentially welfare, to the settlements. These incentives have encouraged many Israelis to move from within the ‘Green Line’ to the OPT. The settlers themselves are clear in their vision for the future of the city: they want to turn Hebron into a Jewish city. Their goal is to expand the Jewish community in the city through political lobbying and by creating ‘facts on the ground’, often through illegal and violent actions aimed at the expulsion of Hebron’s Palestinian population. Israel is the sole power capable of implementing and supporting the settlements in Hebron. Without the state’s political, financial and military support, Hebron’s settlements could not have been established or maintained. Israel’s colonisation of the OPT, like any other colonial enterprise, is principally about resources, strategic control, and land. The settlements are part of a strategy to keep the Israeli control and exploit the locals’ natural resources. Settlements are used to establish physical and demographic ‘facts on the ground’ in order to fortify Israel’s claim over large areas of the Occupied Palestinian Territories. Over the years, Israel has established a network of control in the OPT which is composed of settlements, infrastructural system of roads, settler ‘bypass roads’ (which Palestinians are forbidden to use), military bases and checkpoints. Those elements divide the OPT into small, disconnected entities. The fragmentation and the dismemberment of the Palestinian territories has severely prevented commercial activity and made Palestinian daily life extremely difficult, including access to health and educational infrastructure. Alessandro Petti describes the fragmentation of the West Bank territory through two different spatial forms: the archipelago and the enclave. The first is the landscape of interconnected Israeli settlements, the space of flux, while the second is represented by Palestinian cities and villages, whose main feature is their increasing disconnection and fragmentation. Israel’s policy of isolating Hebron’s settlements and encouraging them is also based on the same “principle of separation and fragmentation”. This includes physical and legal segregation between Palestinians and Israeli settlers. In 1994, immediately after the massacre that took place in the Tomb of the Patriarchs, Israel imposed a curfew on Palestinian residents in Hebron. Since then, Israel has restricted the movement of Hebron’s Palestinian population in the proximity of the settlements. A section of Al-Shuhada Street was closed to Palestinian vehicles claiming that the restriction was needed for security reasons. The restrictions on Palestinian movement were enforced by a large number of staffed checkpoints and physical roadblocks. Most of the shops in this area have been forced to close. These restrictions and prohibitions have expropriated the City Center from its Palestinian residents and destroyed its economy. Having no other option, many families have left the city center. According to the Hebron Protocol, signed by the Palestine Liberation Organisation and the Government of Israel in 1997, the city of Hebron was divided into two sections, known as H1 and H2. Area H1 is under Palestinian civil and security control, comprising 80% of the city. Area H2 is under Israeli military/security control and Palestinian civil control, comprising 20% of the city, including the whole Old City of Hebron. In the autumn of 2000, with the outbreak of the second intifada, Israel increased the severity of the restrictions and imposed a long curfew on H2 area. Residents were forced to stay in their homes day and night for weeks and months, except for a few hours once or twice a week to enable them to supply their provisions. The curfew was never imposed on the Jewish settlers of Hebron. As a result of this long period of prohibitions on movement, and prohibitions on opening shops and businesses, thousands of residents lost their source of income. Commercial activities in this area died, which was a major cause for why residents moved out of the area. This dramatic situation is called by several urbanists “urbicide”: the killing of the city and the killing of the social and economic life in the city. Now-a-days a network of barriers create a continuous strip of land in the H2 area, along which Palestinian vehicles are completely forbidden. This strip, which stretches from the Kiryat Arba settlement in the east to the Jewish cemetery in the west, is separated from the rest of the city, as the army controls and restricts entry of Palestinians to it. The middle of the strip contains many sections of road closed for Palestinian pedestrians. The most important is called Al-Shuhada Street, which is closed to Palestinian vehicular and pedestrian traffic between the Beit Hadassah and Avraham Avinu settlement points. The settlers, on the other hand, are allowed to move about freely in these areas. According to a report from Israeli human rights organization B’Tselem, a policy of “separation” has guided the operations of the Israeli military (IDF) in the area. The Israeli security forces believe that the physical separation of the two ethno-national communities is necessary on both security and operational grounds: this is in order to prevent friction, guarantee the security interests of IDF personnel and Jews living in the Old City, and to ensure military operational efficiency. The result is the creation of “protective spaces” using the elements of the occupation, such as checkpoints and physical roadblocks. These are placed to separate the city of Hebron from the area occupied by Jewish settlers adopting a strategy of “sterilization”. The “sterile” area is usually the zone located around the settlement’s compounds, from which Palestinian pedestrians are forbidden. Due to this complex and eerily encrouching policy of occupation, Hebron is turning into two different cities. Area H1 and H2 are increasingly two different towns, divided by physical elements and difference in social classes. The mass departure of the residents that could financially afford to leave the area has transformed the Old city in an almost-empty neighborhood, heavily controlled by the Israeli army and today mainly inhabited by the lowest socio-economic classes of Hebronite society. The H2 area is additionally fragmented through a “strategy of separation”, including the presence of physical elements such as closures, barriers, settlements and legal strategies of discrimination between Palestinian and Israeli settlers based on national-ethnic criteria. Palestinians are subject to a system of military law Israel enforces in the West Bank as opposed to Israeli settlers, who are tried under Israeli penal law in courts inside Israel. Using these measures, Israel have expropriated the City Center from its Palestinian residents and destroyed it economically. This schemed strategy based on prohibitions, omissions, restrictions and fear has exasperated the lives of Palestinian residents, making it impossible for them to continue to live and work in the area. The H2 area would have already become a Jewish-only area if not for the perseverance of local families resisting the settlements by living inside the occupied zone. Thanks to their presence, these Palestinian families have prevented the settlers from occupying the whole area, they are the main symbol of nonviolent resistence. By continuing to live in their houses, take care of their olives trees and walk in the streets inside the H2 area, they give hope that one day this land will be returned to the local owners. Their resistance keeps the hope alive that Palestinians will one day come back to their homes, the merchants will reopen their shops and Al-Shuhada street will once again turn back into one of the most lively and vivid commercial streets not only in the city of Hebron, but all of The West Bank. With the rise of Islamist organizations, repressive regimes, and civil conflicts which threaten regional stability, the promise of the Arab Spring of 2011 quickly devolved into an Arab winter.In an expansive article in The Economist, the threat to the Middle East is discussed in appropriately grave terms; Syria and Iraq are in flames while Jordan looms as the next domino to potentially fall. Libya and Yemen, where Islamic terror networks operate with impunity, are labeled “failed states.” Those Middle Eastern nations that are not in danger of imminent collapse are either absolute monarchies or counties which merely maintain the false edifice of democracy. There is one country, however, which shines as a beacon of freedom for the region. It’s commitment to the rule of law and the maintenance of the basic standards of human dignity serve as an example to its neighbors. No, not Israel, silly. Tiny Tunisia is The Economist’s shining city on the Arab hill. While the author has a case to make for Tunisia’s shift toward Western democratic standards in the wake of the self-immolation of a native fruit vendor who inadvertently sparked the Arab World’s great but failed awakening, there is less of a case to make for Lebanon as a more democratic nation than neighboring Israel. While representatives of the government in Beirut often pledge their devotion to secularism, that country has also been a safe haven for fighters allied with Iran and Syria for years. And, while ISIS in Iraq is receiving much of the media’s attention, the Syrian civil war long ago expanded into the Lebanese theater. Syrian Army officials fighting alongside Hezbollah have been unable to dislodge Islamic radicals hiding out in Lebanon’s near lawless Qalamoun region near the Bekaa Valley. The expert added that these fighters would continue battling the Syrian army in Qalamoun and could also coordinate attacks inside Lebanon in an attempt to strike Hezbollah at home. The prospect of yet another Levant nation falling to ISIS puts the lie to the notion that Lebanon is a model for popular democracy in the Middle East. Though it is not clear that the author intended to even make that case; Israel is barely mentioned in his piece and, when it is, it is only discussed in the context of the fracturing of the Palestinian Authority in the noncontiguous Gaza and West Bank territories. George Ḥabash, (born 1925/26, Lydda, Palestine [now Lod, Israel]—diedJanuary 26, 2008, Amman, Jordan), militant Palestinian and leader of thePopular Front for the Liberation of Palestine (PFLP). Ḥabash was forced to flee Palestine in 1948, after the State of Israel was established there, and earned a medical degree at the American University of Beirut. In the early 1950s he was active in the “Youth of Vengeance” group, which advocated violent attacks on traditional Arab governments. Ḥabash founded the militant PFLP after his goal to liberate Palestine through Arab unity proved unrealistic following the Arab defeat by Israel in the Six-Day War of 1967 (see Arab-Israeli wars). Under the leadership of Ḥabash, the PFLP staged several airplane hijackings, including the abduction of three Western passenger jets to a Jordanian airstrip in September 1970. These activities destabilized the Jordanian monarchy and triggered King Ḥussein’s crackdown on Palestinian guerrillas operating in Jordan. A bloody civil war followed, in which the PFLP and other guerrillas were driven from the country. Ḥabash, a Marxist, visited China in 1970 (where Chinese leaders criticized the PFLP’s “foreign operations”) and Moscow in 1972. Following the Yom Kippur War of 1973, Ḥabash became the leading voice of the “Rejection Front,” four Palestinian groups that opposed any diplomatic settlement to the conflict with Israel. He attacked what he called the “defeatist” attitude of the Palestine Liberation Organization’s leadership, whose attempts at reconciliation with King Ḥussein he sharply criticized. Under his leadership the PFLP successfully organized clandestine cells in the Israeli-occupied West Bank and Gaza Strip. Ḥabash stepped down as leader of the PLFP in 2000.